I colored him with my black, gray, and lavender ProMarkers, die cut him with my largest stitched squares set (Cheery Lynn) and then cut a mat from purple CS with a larger die from the same set. Before framing the image with it, I ran it through the embossing machine using my "Linen" embossing folder. The ribbon is from my stash and the butterflies have been waiting to be used for way too many moons. A nice CAS design to showcase this wonderful puppy. Please continue to leave comments. The "Word Verification" really isn't on. BLOGGER INSISTS ON SHOWING THE "CAPTCHA" ICON BUT IF YOU IGNORE IT AND JUST PUBLISH YOUR COMMENT, IT WILL POST JUST FINE. I WISH I COULD GET RID OF IT BUT THERE'S NO OPTION FOR THAT WHEN THE COMMENTS ARE WRITTEN IN A SEPARATE BOX. SORRY. Do you know about Pocket Dragons? I remember when I first heard about them. I was in my pre- or early teens and, as we sat around the campfire on a family camping trip, I commented that the fire looked like dragons when the tops of the flames were blown horizontal by the evening breeze. My dad said he didn't know about campfire dragons but he did know about Pocket Dragons. 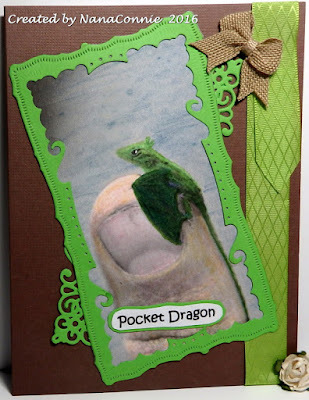 Pocket Dragons are very, very small and never seen by humans. The only way you even know they exist is by finding their bedding or pillows. If you have ever reached your hand into one of your pockets and found a bit of lint, perhaps shaped gently into a tiny pillow, then you know you have a Pocket Dragon living with you and you should treat it oh, so very kindly because they are loyal and good friends, even tho' you can't see them. All of that being true, I believe this may be the first ever picture of a Pocket Dragon! 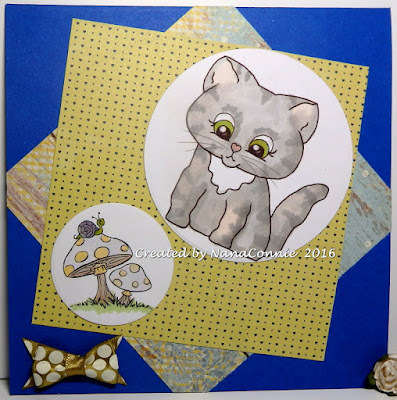 Colored with watercolor pencils and ProMarkers, cut with a die from Spellbinders, framed with another die from that same set and still a third die used for the filagree in the background. Ribbon from my stash and burlap ribbon used for the bow. 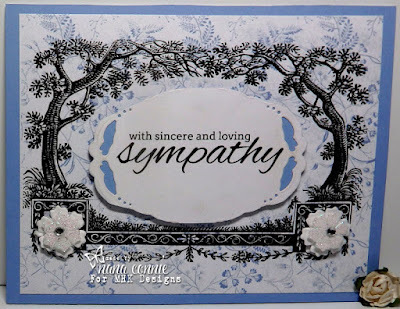 On my blog last Thursday, I shared with you a sympathy card I had to make for family friends who lost their 'special needs' daughter at age 19. This is a second card for the same family at the request of my own daughter who has been a close friend of theirs for 25 years. 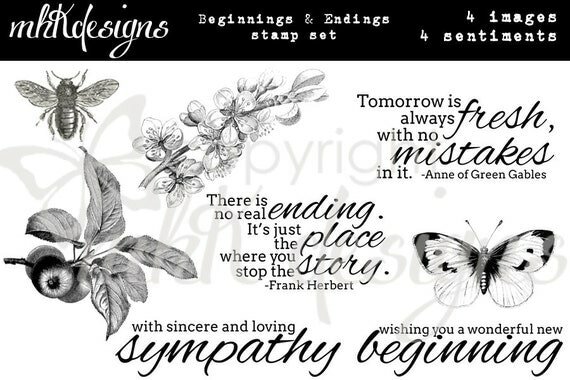 I chose image, sentiment, and digital dp from MHK Designs and am going to use this as my Designer's Inspiration card this month. turned 1/4 turn for horizontal design. 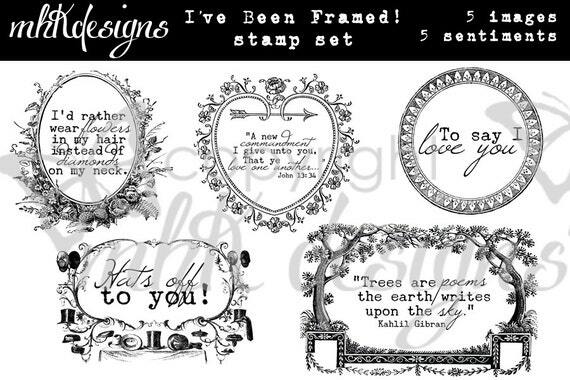 Sympathy cards are never easy to make but these frames from the new "I've Been Framed" set give lots of options for simple but elegant cards. I chose the "Tree Frame" from the set. The background is dp from the "French Country" set and the sentiment came from the "Beginnings and Endings" set. I die cut the sentiment, backed it with blue CS, cut it again, and added it to the inside of the frame with dimensional dots. The two flowers were in my stash and have just a touch of glitter on them. as though the sketch was turned 1/4 turn..
All of the papers are digital papers, printed out and then run through the printer a second time to print the image onto them. Obviously, I had to print the image four times to get it onto each paper, then I hand cut each section and adhered it to a copy of the image printed onto white CS. Very different from my usual coloring on all my QKR images. The ruffle part of the heart is colored with distress ink. I cut the sentiment with a smaller die from that same set. 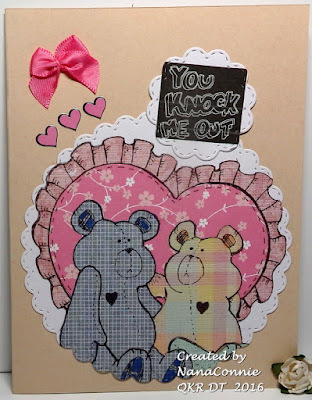 Both of those pieces were added to a beige card front, and then I tied a bow from pink, satin ribbon and added the three little hearts which have been in my stash since I was making Valentine cards last winter. 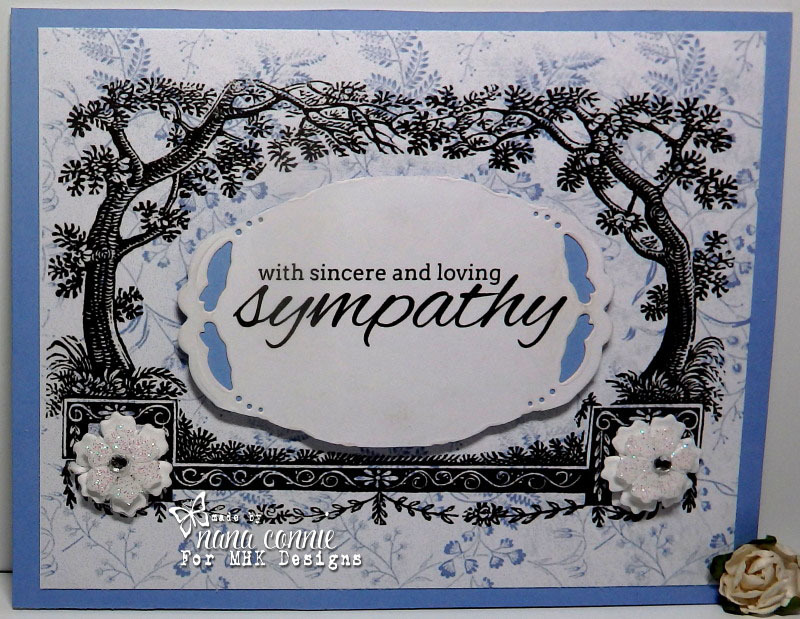 Sympathy cards are the most difficult cards for me to make and I suspect that's true for most of us. I'm never able to get a stash of them put by so end up making them as needed. The occasions are always sad and stressful for those left behind, suffering the loss, but it seems even more difficult when the loss is felt by a parent who has lost a child. In this case, close family friends have lost their 'special needs' daughter at the age of 19. 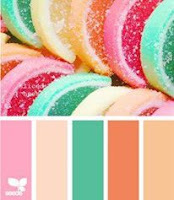 I pulled colors from Cupcake Inspirations. The image (from A Creative Need) is colored with ProMarkers and the sentiment is from MHK Designs. I wanted something very CAS so limited embellishment to just a bow-tie bow, hand-tied. The little snail and mushrooms image came from Drawn by Krista and it seemed perfect for the line-of-sight object which caught the kitten's attention. I colored both images with my ProMarkers and a couple of Copics, then die cut with simple circle dies (QuicKutz.) Both papers were scraps left over from scrapbooking and the blue background is the actual card front. I used one of my bow-tie bows for embellishment, keeping it pretty flat and CAS. I haven't decided on a sentiment yet but I'd guess that when it grows up, it's going to be a masculine birthday card. 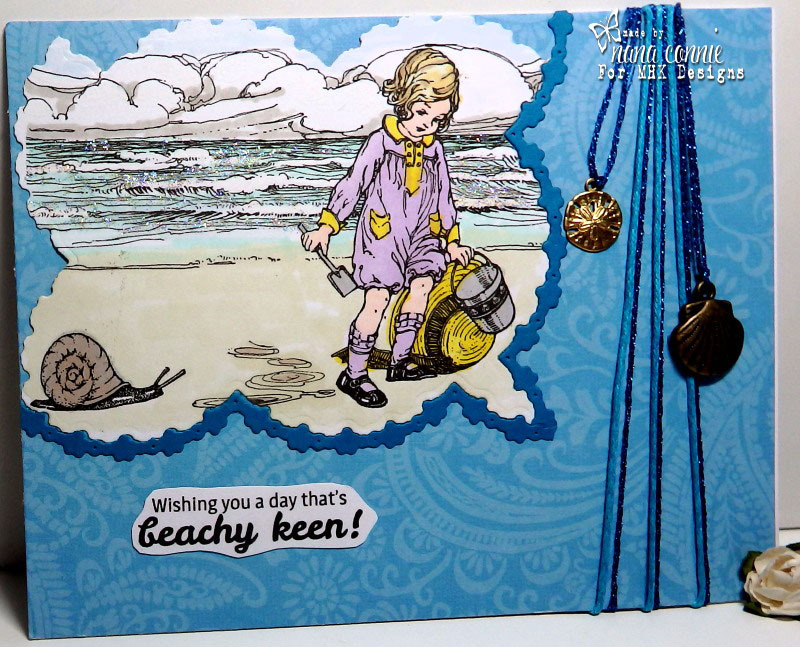 Hello, and welcome to our SURPRISE Birthday Beach Blog Hop for the lovely Asha! You should have arrived here from MYNN KITCHEN's blog. If not, start at the MHKDesigns blog to complete the hop for more chances to WIN ! 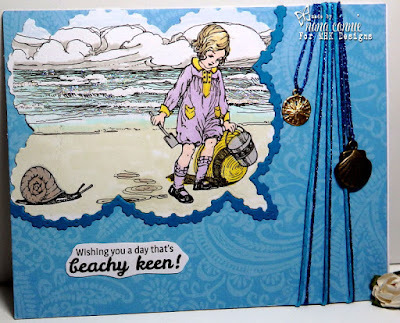 We are celebrating a very special lady today, and we're doing so by creating beachy birthday cards to wish her many happy returns! 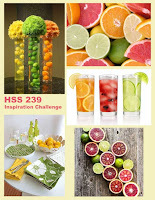 Here's our Inspiration Photo for this challenge which runs from June 21 to July 17. 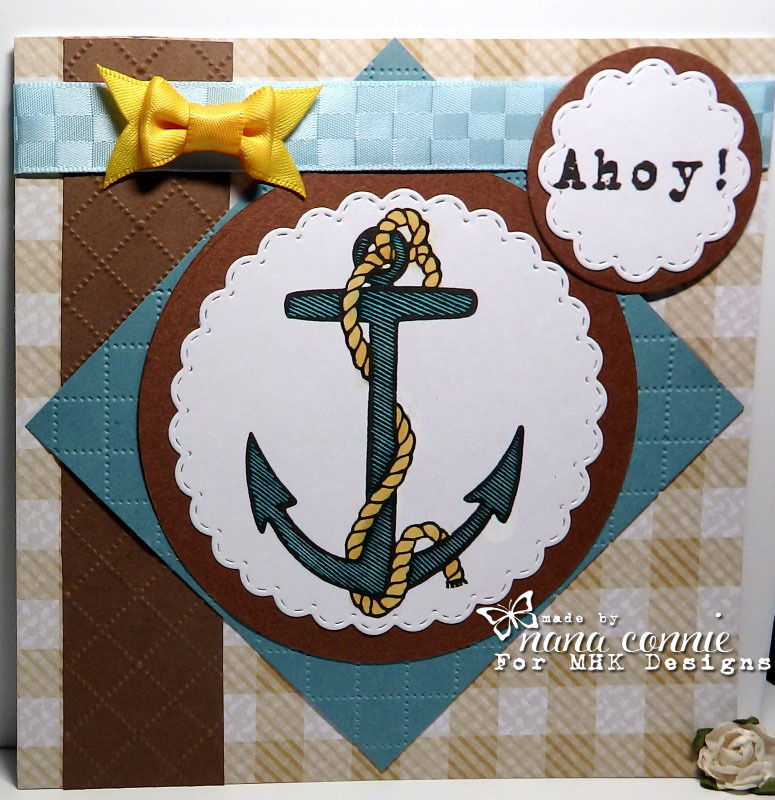 And here's my card using the Anchor from the "Serene Seaside" set available at MHK Designs. also make a great birthday card for either gender. So, Happy Birthday, Asha ! The personal greeting is on the inside. 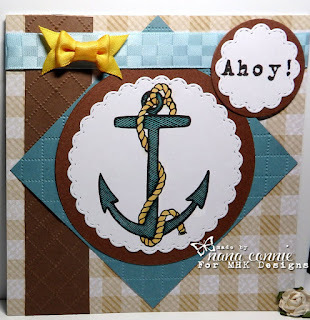 I used my ProMarkers to color the anchor and then cut it with a stitched scalloped circle die from Memory Box. The plain circle is done with a die from Spellbinders. 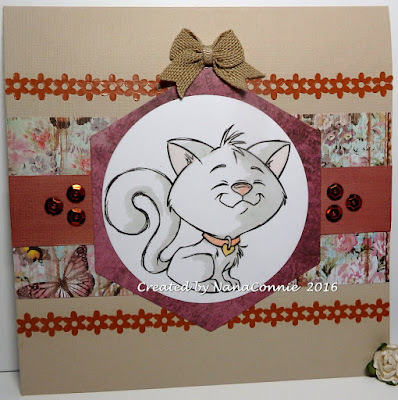 I used a Darice embossing folder on the blue diamond and the brown CS strip. Thank you so much for joining in our hop to say "Happy Birthday" to a dear friend! Your next stop on the hop is ROCKY CRAFTER's blog! Before I started, I knew I wanted to do a shaped card but I wanted something a bit different. 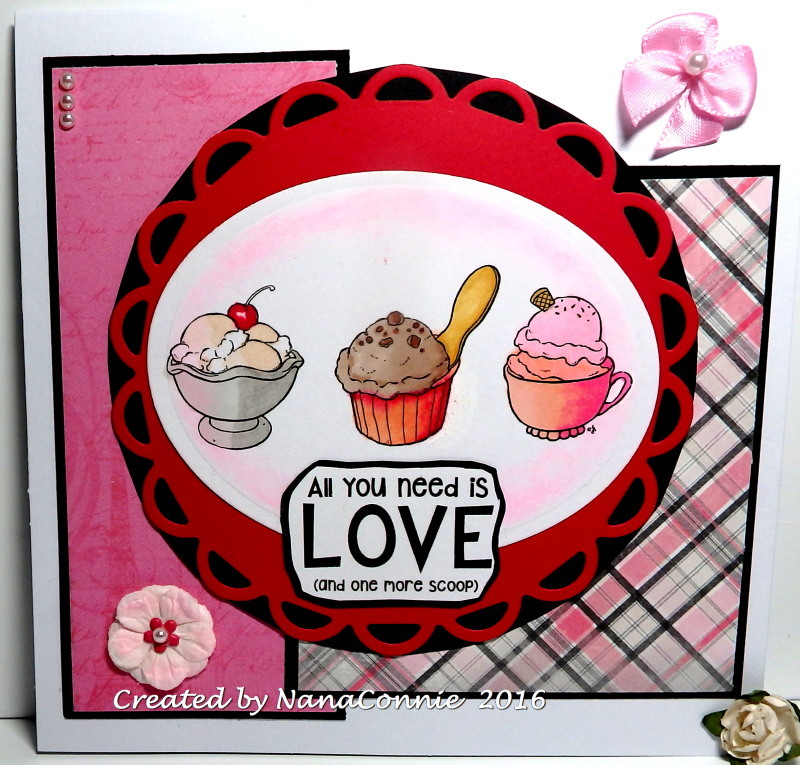 I started planning by looking at my newest set of Spellbinders dies, Labels Seventeen. I knew I could use the largest die to cut the actual card shape, and then repeat it in both the image shape and a frame. Having decided on that, I used my ProMarkers to color the image, then started die cutting all the various pieces. The polka dot dp is from SU and I cut a long rectangle then punched the corners. The sentiment was printed and hand cut. I added the bow which was made from white, satin ribbon, dyed blue with a marker. I decided on the sketch from The Outlawz. Can you believe how faithful I was to the design? 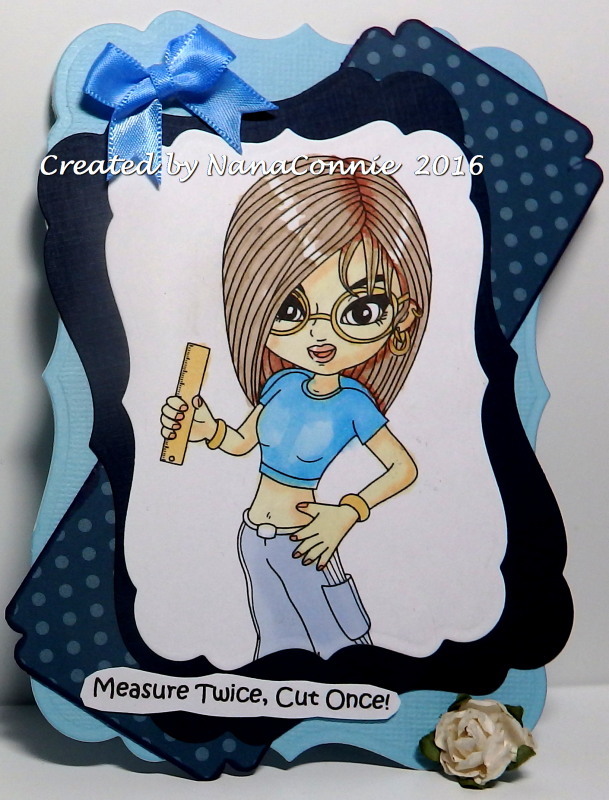 I grabbed my ProMarkers, colored the image, and cut it with a circle die from QuickKutz. I dug into my storage of alcohol inks, chose three and brayered them across a stamped background scrap, then die cut a hexagon shape and used it for the frame around the image circle. 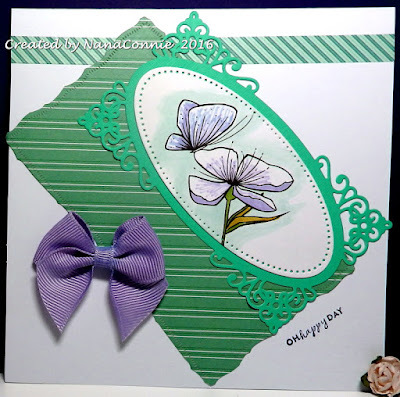 I cut strips of CS and Paper Studio dp, layered them onto a card front and added the borders of flowers above and below the strips. For embellishment, I added sequins (my one diversion from the sketch which had buttons) and a burlap ribbon bow. No sentiment on this one yet because I haven't decided how I'm going to use it. 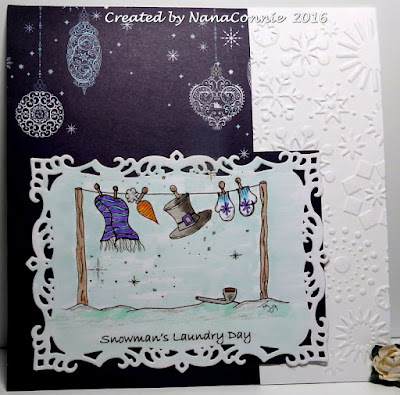 Here's today's release coming from MHK Designs this month and I had so much fun making this card! Of course, it didn't hurt that I did it entirely in purples, my favorite color. :-D The set is called "I've Been Framed" and you can see a photo of the entire set at the bottom of this post. My process for getting this image printed was a bit different than my usual "select and print." First, I chose a dp from the MHK Designs "French Country" set (photo also at the bottom of this post) and printed it the size I wanted. 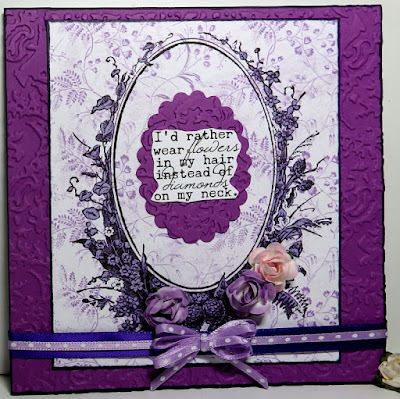 There are some gorgeous papers in that set and I chose the "Fern" in lavender. After printing the paper, I put it back into my printer and then printed the flower frame right onto the dp, adjusting the placement and size to fit the pre-printed dp sheet. I used ProMarkers to color most of the flowers on the frame, choosing to leave a few uncolored so that they are white. 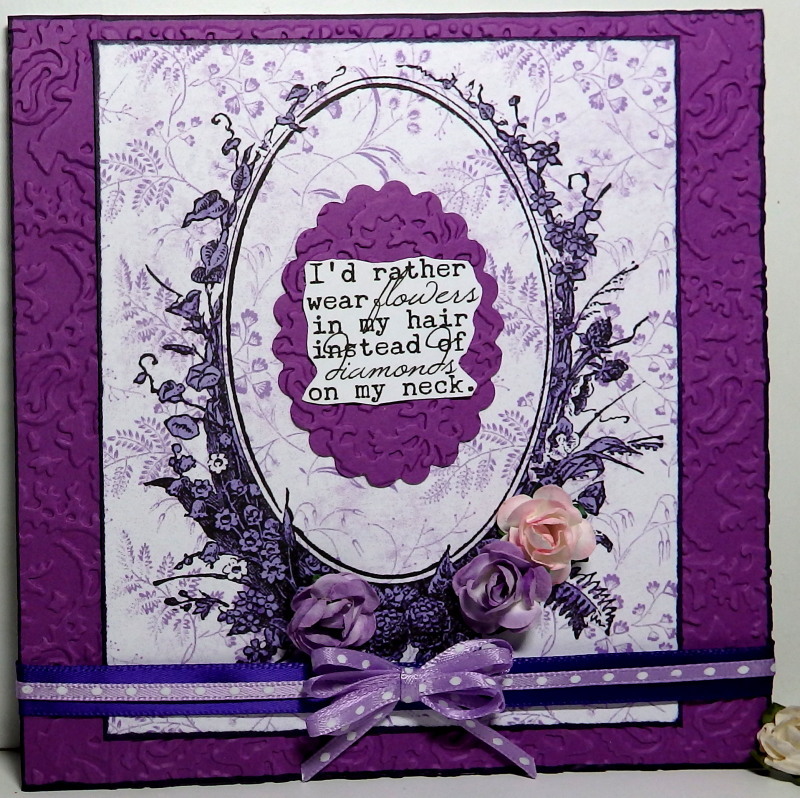 I used a Cuttlebug embossing folder to dry emboss the purple CS onto which I centered the image piece. 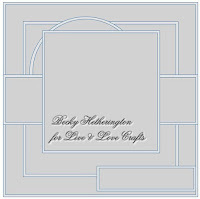 I also die cut a small scalloped oval piece (Spellbinders) and embossed it with the same folder. Next, I printed the sentiment, hand cut it, and mounted it onto the embossed oval, then put that in the middle of the frame. Finally, I added the roses and the ribbons, and tied a triple-loop bow. This delightful bride is from Morgan's ArtWorld and is the June image on their FB page. 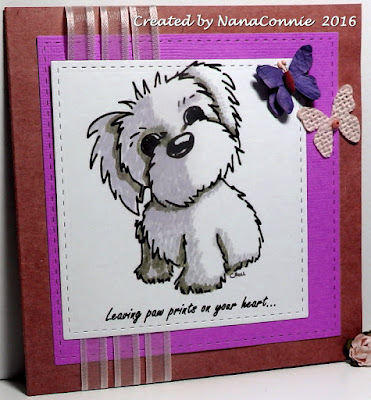 The sketch came from Live and Love Crafts. I colored with ProMarkers and added glitter to her dress. I made the inset, double frame by cutting two colors of CS (black and turquoise) with dies from Spellbinders, putting one inside the other. 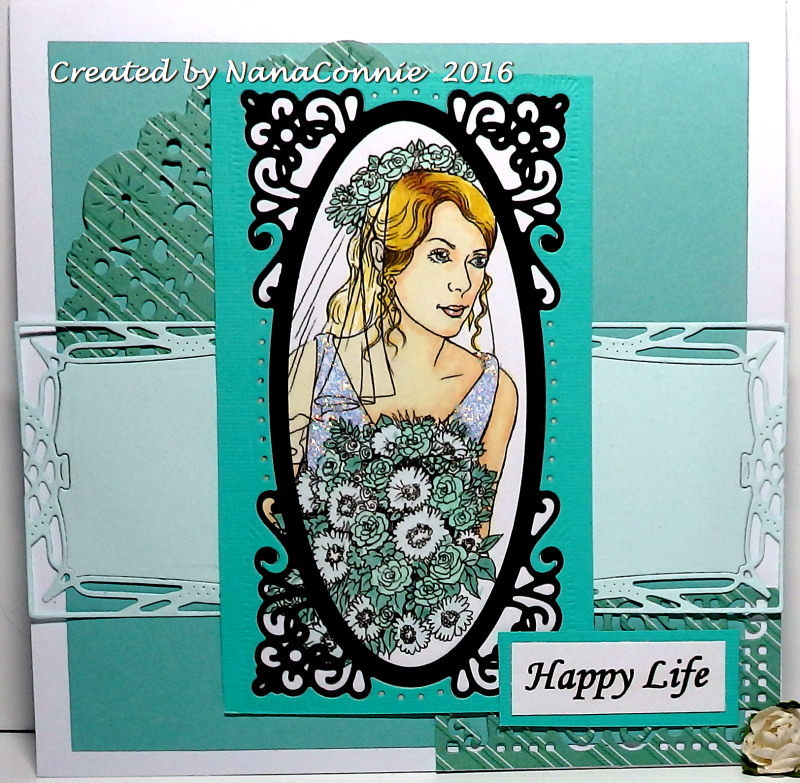 The pale aqua die cut is done with a die set from Cheery Lynn, cut in half so I could elongate it since the part behind the image doesn't show anyway. The round doily is cut (Cheery Lynn) from CS by SU, as is the small rectangle in the bottom corner. 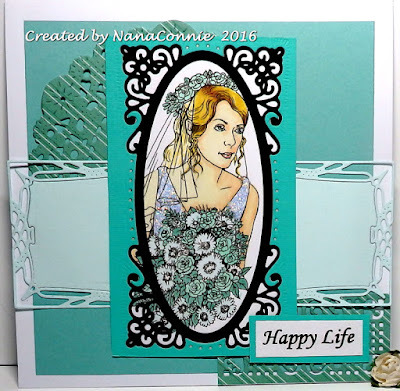 Everything is layered together on another piece of aqua CS, then put onto a white card base. While I was making this card, I had a conversation with one of my grandkids during which I said I was making "Sizzlin' Summer" cards. When they objected that aqua was a cool color, not a sizzlin' color, I replied that as far as I was concerned there were no better colors when dealing with 102 degree temperatures outside. So, these are MY "sizzling" colors! I used ProMarkers and chalk markers to color the image, and added glittery Snow-Tex to her wings. Then I fussy cut her, added a mat of dp and fussy cut again. That piece got layered onto a die cut stitched frame (Die-versions) and I added that to another piece of the dp. I stitched around that after I mounted it onto white CS. I added a strip of satin ribbon, then tied a bow using velveteen ribbon. Everything was put on a 5.5" x 5.5" card base. Finally, I matted the sentiment and added it to the card front. This is just begging to be used for non-traditional Christmas card, don't you think? OK, maybe it'll get used as a young child's birthday card before then but if not, it's going in my Christmas stash and I'm going to pretend that stardust is what brings children "visions of sugar plums" while they sleep. 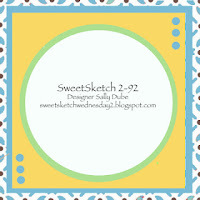 I'm so excited about the latest release at MHK Designs! 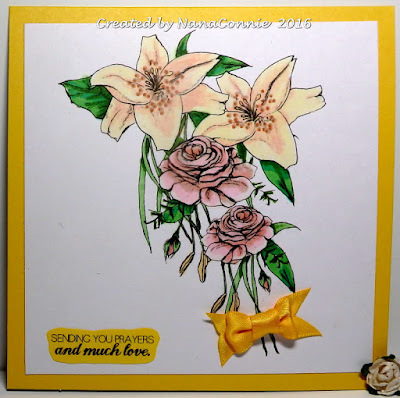 Over the next 5 days, our DTs will be showcasing the newest sets so be sure to check the main MHK Designs blog to see them all. Since I'm gone much of this month, I only have two of the sets to share but I love them all. 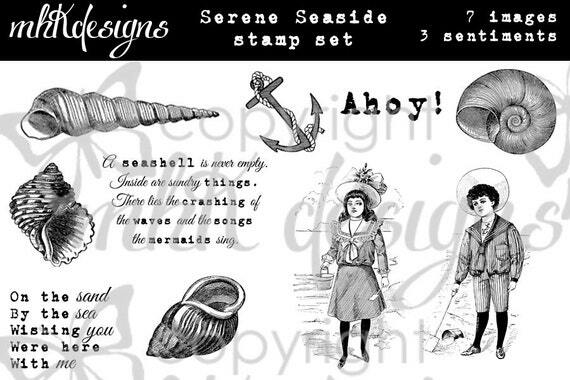 The first set is called "Beachy Keen" and I had so much fun playing with it. Both the image and the sentiment are included in the set and you can see a photo of the set at the very bottom of this post. I used my ProMarkers and some chalk markers to color the image, then added a tiny bit of glitter and some white gel ink to the ocean. I used a die from Spellbinders to cut the random shape around the image, and you can see the actual shape of the die in the dark blue CS 'bunting' I added to two sides of the image. I wrapped twine around the dp and then added the two little shell charms, finally adhered the sentiment and called it finished. Well, this was supposed to go live at 6:00 this morning but something happened with the pre-scheduling. No matter, here it is now. 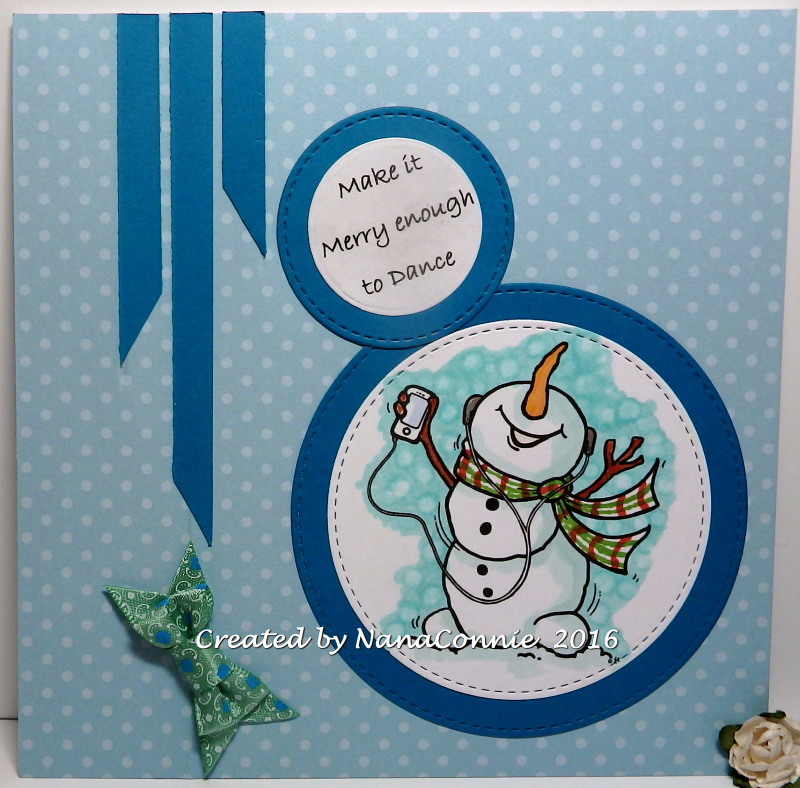 This morning, I'm sharing with you a delightful, new-to-me, Dancing Snowman (From the Heart Stamps) and now I have a second Christmas card in the stash. I've discovered I'm going to have to make 2 to 3 per week for the rest of the year in order to have enough for my Christmas needs. 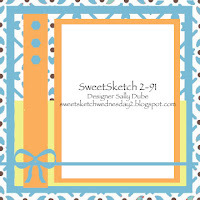 I started with the sketch found at From the Heart Stamps. 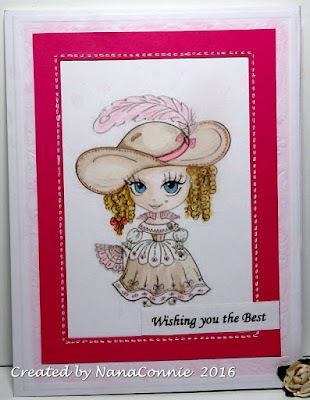 This darling image is from Julia Spiri and I think she makes a perfect birthday card for a young lady. I chose colors from Color Crazy. She's colored completely with chalks and framed with a stitched die cut from Die-Namics. That frame is actually a negative, trimmed to fit and layered on top of the image. The sentiment is printed with a computer font, then cut and added. I used a white gel pen to highlight the stitches made by the die. 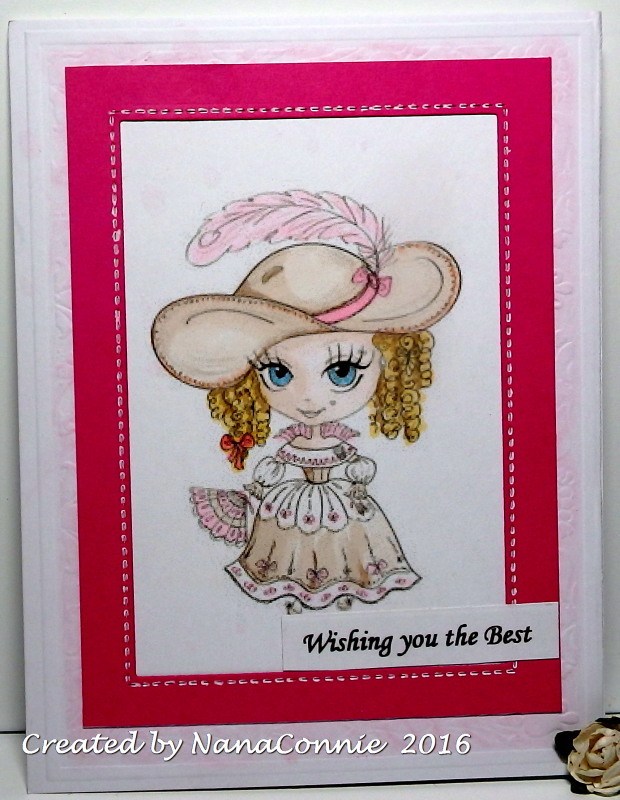 I embossed the card front and used pastel pink chalk to highlight the embossing. However, it doesn't show up all that well in the photo but if you enlarge it, you'll get a better view. No embellishments beyond the chalk and embossing because I wanted a really CAS design. I colored the image with ProMarkers and Copics, then cut her with my newest Sue Wilson die. All the die cuts on this card are done with dies from that same Sue Wilson set. The sentiment is printed and hand cut. I added the row of pearls and then chose two bronze pearls plus the bow for additional embellishment. I love this simple image and decided it would look best if the card design was also rather simple. The image is from Sami Stamps. I colored the butterfly and the flower with ProMarkers and added the shadow behind them with chalks. The striped dp is from SU and the dies are from Spellbinders. 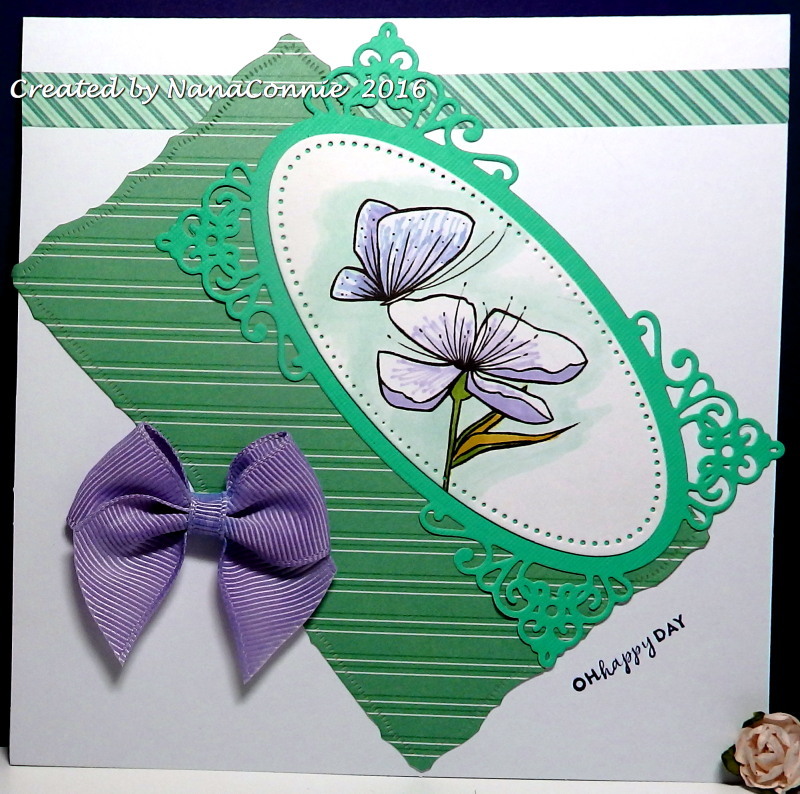 The bow is 'dyed' with an orchid ProMarker. Have you ever noticed how long it takes for a planned summer vacation to finally get here, only to have it disappear into a puff of photos and memories in far too short a time? 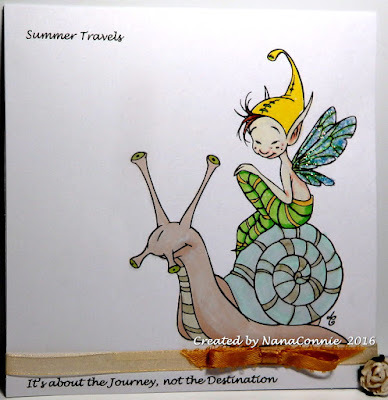 I think I've found the solution -- travel at a snail's pace, enjoying the journey with no specific destination in mind. :-D Hmmm, that might work for aging and having birthdays, too! What do you think? This delightful image is one I found in my collection from Emerald Faeries and I don't remember what it's called but I think it's adorable. I colored with ProMarkers, chalks and glitter. 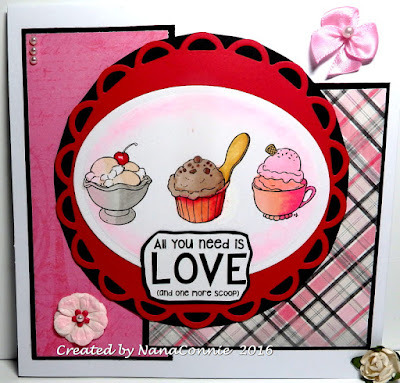 This is a single layer card with the image and sentiments right on the card front. I added one layer of sheer ribbon and a single layer bow made from satin ribbon. It's about as CAS as you can get. Please continue to leave comments. The "Word Verification" really isn't on. BLOGGER INSISTS ON SHOWING THE "CAPTCHA" ICON BUT IF YOU IGNORE IT AND JUST POST YOUR COMMENT, IT'LL BE THERE. I WISH I COULD GET RID OF IT BUT THERE'S NO OPTION FOR THAT WHEN THE COMMENTS ARE WRITTEN IN A SEPARATE BOX. SORRY. and decided to use them. 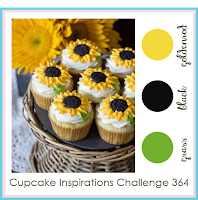 I have no idea why I chose green as the majority color - all the citrus shades seem equally represented in the inspiration photo - but that's how it worked out. 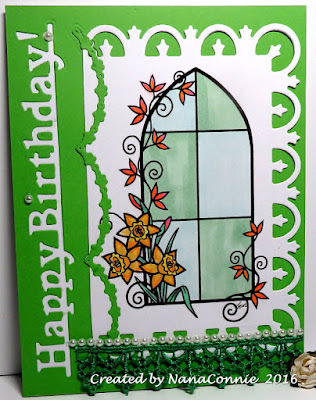 Before I ever started coloring the image, I used one of my Spellbinders dies to cut the Happy Birthday into that lovely, green CS and then decided that the negative should go on the card front. That entailed scooping up the tiny bits that drop out of the letters "H," "a," "p," "B," "h," and "d" and gluing them back where they belong. Then, I also cut a strip of 'bunting' but used the positive of that one. The window in the image is colored with water colors and then I used ProMarkers to color the flowers and vine after the water colors were completely dry. 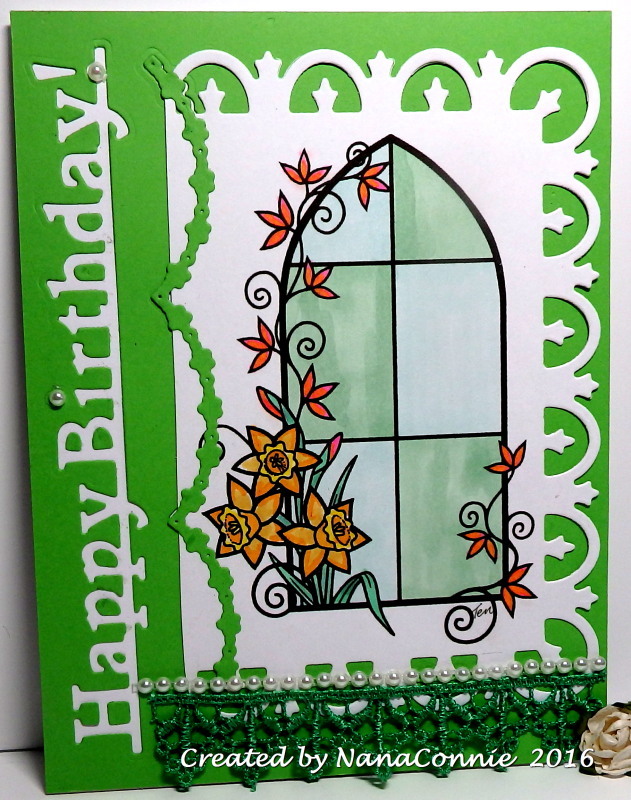 You can't see it in the photo, but the watercoloring left a wonderful texture on the window panes. The image is cut with another die from Spellbinders but I trimmed the decorative border along one side because the bunting just got lost otherwise. My dad was a man who never expected any kind of fuss to be made over him, not even on his birthday or Father's Day. 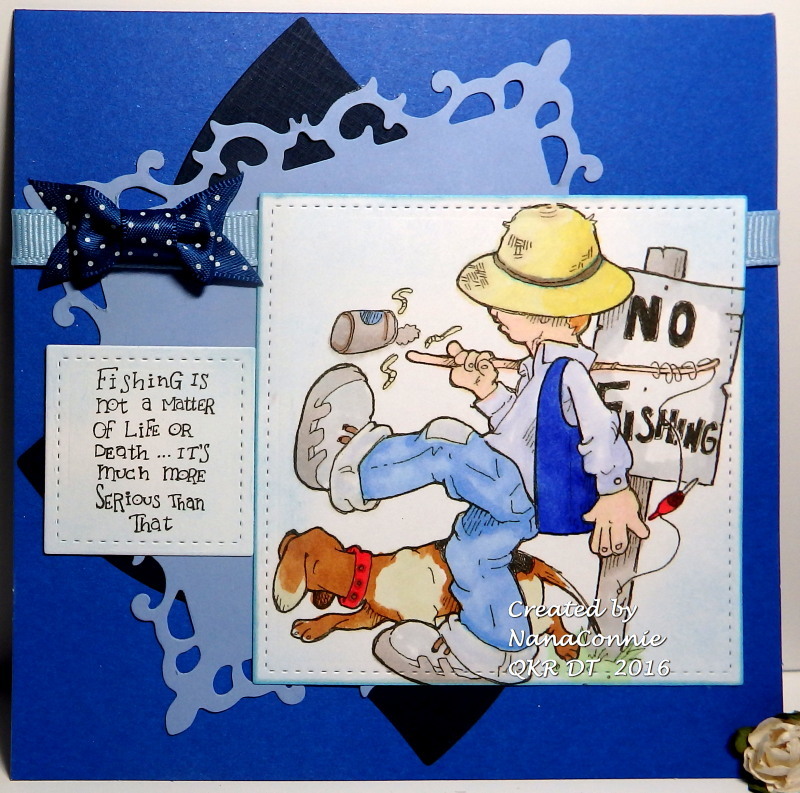 He used both of those occasions every year as an excuse to go fishing and just have quiet time. Since both his birthday and Father's day were in June and since I was out of school by that time, I got to go with him on many of those occasions. It was wonderful, father-daughter, quiet time and I still love fishing and enjoying serene, quiet time. 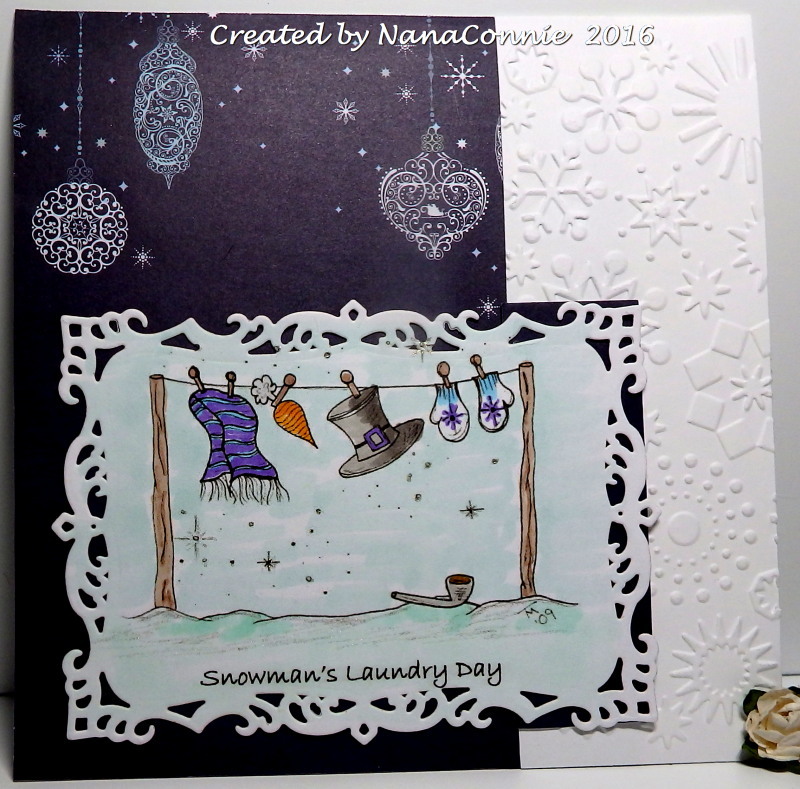 Colors are from The Outlawz Color Challenge. Blue isn't necessarily required but a monochrome creation is. 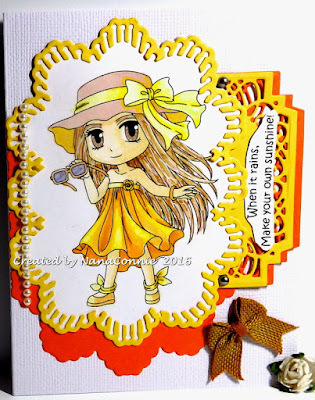 I based this design on the sketch at Paper Play Sketches. I used the sketch from the challenge there also. The image is colored with ProMarkers, die cut with a die from Spellbinders, and I used chalk to highlight the embossing on the die cut. I added a circular mat, also cut with a die from Spellbinders, and matted that with black card stock, fussy cut into a circle. 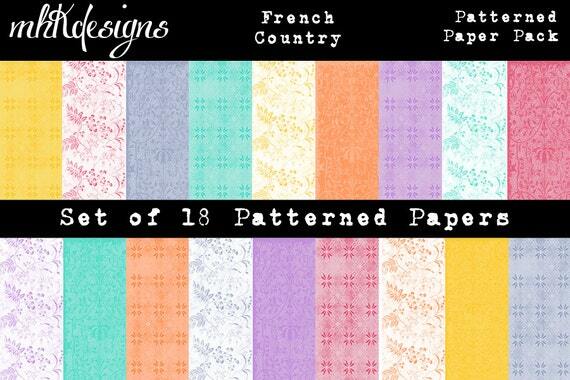 The papers are scraps which originally came from Authentique. 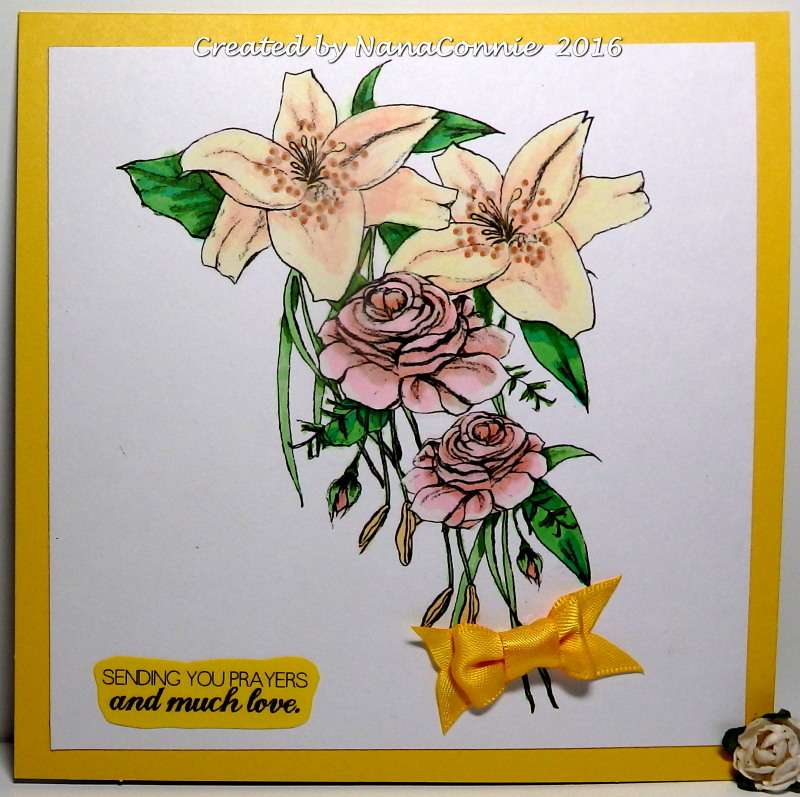 I embellished the card with a bow, a layered flower with a brad and a pearl - chalked to give it a touch of color, and a bow with a pearl. Finally, I added a trio of pearls to the upper corner. 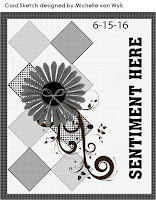 The sentiment is part of the image set, printed, hand cut and matted, then hand cut again.